This is one of 35 marionettes known as of the Tiller-Clowes troupe, one of the last remaining Victorian marionette troupes in England. Marionette shows were a popular form of entertainment for adults in the 19th century. Many troupes were family concerns which travelled round the country long before the advent of film or television, presenting shortened versions of London's latest popular entertainment including melodramas, dramas, pantomimes, minstrel shows and music hall. In the 18th and early 19th centuries their theatres were relatively makeshift, but after about 1860 many became considerably elaborate, with walls constructed from wooden shutters, seating made from tiered planks of wood, and canvas roofs. The figures were carved, painted, dressed and performed by members of the company. This is a man-about-town or a 'masher' who would have been a stock character, used in any play requiring a young villain. His carved moustache, and the beer bottle with an eyelet in the top so that it could be drawn to his lips for frequent drinking, indicate that he was a character 'up to no good'. His right hand is carved closed to hold a prop, such as a gun. Carved wooden marionette; a young middle-aged man or 'masher' with a carved full moustache, painted black; black painted carved hair, and a painted pink complexion. He has brown glass eyes. He wears cream brushed cotton trousers (possibly formerly a cot sheet); a green and white tweed waistcoat with green velvet trim, and a green, white and yellow checked tweed jacket. His feet are painted black. He has a tucked shirt (possibly original, due to the tucking) and a yellow bow tie. His right hand is closed, and he brandishes a beer bottle in his left hand. There is an eyelet in the top of the bottle for bottle-to-mouth movement, and there are two small eyelets at the sides of the jaws and ears, suggesting a possible former use as a trick figure, or for a special movement such as pulling up both arms in shock/horror! Wooden oval yoke, hollow for the neck joint, and an oval wooden pelvis. Legs are attached by cotton tubes, tacked on, and the lower legs have tongues to upper legs for the knee joints, also wooden ankle joints allowing good flexibility. Two control bars; bar 1of five notches, bar 2 of two notches, with later screw eyes for fixing the bars together and for run- through hand strings. This marionette, along with the rest of the troupe and three of their original backcloths, had been stored in a blacksmith's shop in Lincolnshire for over thirty years, but after cleaning and re-stringing, most of the marionettes were restored by Gerald Morice and George Speaight who purchased them in 1945. They began working on recreating some of the puppets' original repertoire. Since the original cloths were too fragile for performance, new backdrops were painted, and in August 1951 as part of The Festival of Britain celebrations, the marionettes took to the stage again as The Old Time Marionettes, at the Riverside Theatre, Festival Gardens, Battersea Park. 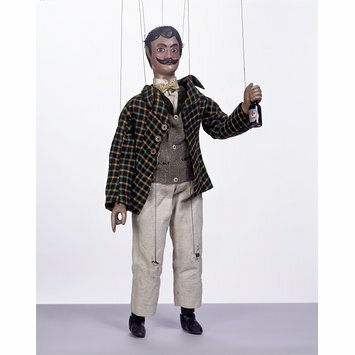 In the 1980s George Speaight lent the troupe to puppeteers in Germany but in the late 1990s he sold them to John Phillips, an expert puppet carver, manipulator and puppet historian, whose widow sold them to the Museum after his death in 1998. Carved wooden marionette from the Tiller troupe. Stock character representing a young middle-aged man or 'masher' brandishing a beer bottle. Made by the Tiller family circa 1870 to 1890. The Saturday Book - 25. 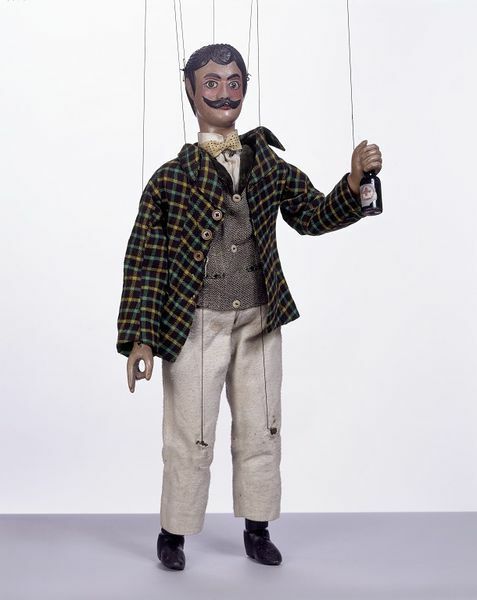 It is impossible to identify the precise maker of this marionette since the company made, altered and used figures throughout its career. It is possible, however, to distinguish distinct types, and therefore groups, made by different makers, due to the type of carving. The carver of this object has been distinguished as Maker B because of its standard sized head.